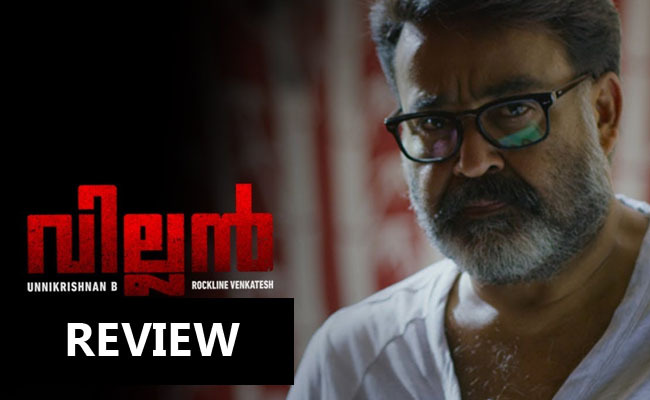 Villain Malayalam Movie Review : Knowledge can sometimes be a Villain! “Somewhere beyond right and wrong, there is a garden. I will meet you there”, these are the words of Rumi. However, in this scenario, we should have quoted at least a couple of lines of Shakespeare; because, that was the kind of influence which the ‘Bard of Avon’ has exerted on scriptwriter – director B Unnikrishnan. While there were some evident quotations from ‘Macbeth’ and ‘Romeo and Juliet’, you would be tired of mentioning the paraphrases, which Shakespeare has loaned B Unnikrishnan. Mathew Manjooran (Mohanlal) is a senior police officer, who has returned to the police force after a gap of 7 months, only to take Voluntary Retirement, in order to forget the past behind him. Brilliant indeed, the entire force pleads before Mathew Manjooran to pause for a while and rethink, which he refuses. Well, an interesting and mysterious case comes before the police department; coupled with some emotional blackmails, Mathew Manjooran was onboard. From then onwards, we can’t say a single word about this movie, which is sure to unravel the mystery prematurely. Speaking about the story of the movie, as we quoted Rumi earlier, it was a game between the protagonist and antagonist in deciding who the actual villain was. Both of them have their own justification about what they had done and both thinks they’re right. What we are presented before by B Unnikrishnan, is a volley of long monologues by the lead star, all of which were tempered with philosophical celebrations. Knowingly or unknowingly, it was over these highly impregnating dialogues, which the script by B Unnikrishnan rode over. Well, one cannot miss those sugary coated mellifluous sentences uttered by Siddique about Mohanlal – something which has been a tradition with all B Unnirkishnan movies. Visually, ‘Villain’ offered a good journey, while the performances from all the artists were of top notch. Mohanlal, shedding off his hero image, has given a fantastic piece of acting. Barring those heroic moments (evidently to please the fans), he shows why there is no one to replace him, or maybe no one will ever (at least in the near future). Vishal, getting a meaty role, excelled his part and his Tamilian characterization has definitely given him chance to showcase his acting prowess. Besides these two guys, there were a number of known faces, all of whom did decent jobs. Speaking about Manju Warrier, it was a kind of an extended cameo appearance from the lady superstar, and you known how flawless she can be. About the songs, besides the melodious track sung by Yesudas, the other two ones did nothing good for ‘Villain’. Amidst all the technical superiority which ‘Villain’ boasted, how came those out of sync dubbing moments? Anyway, since B Unnikrishnan decided to pump up his fanfare to Shakespeare, we have the luxury of opting the lines of a modern poet in describing the movie; quoting WB Yeats, “Turning and turning the widening gyre/the falcon can’t hear the falconer”. After a particular point of time, ‘Villain’ entered some sort of a region, where even Mr. B Unnikrishnan seems unable guiding it.